There’s been some confusion surrounding the upcoming expansion for Xenoblade Chronicles 2. Nintendo of Europe caught onto this and released an image via Twitter clarifying the exact options available to Switch owners. There are two ways to play the new expansion. You can buy the standalone physical game card edition which does not require you to own an existing copy of the game or you can download the prequel story digitally if you own the Expansion Pass. From next month, you'll be able to play the additional story DLC for #XenobladeChronicles2, Torna - The Golden Country! Expansion Pass owners can download it from 14/09, while the standalone retail version will be available 21/09. Torna – The Golden Country allows you to venture back in time and experience the fall of the kingdom 500 years prior to the modern events of Xenoblade Chronicles 2. You’ll need to save the day and defend yourself from Malos and his powerful forces as you make use of a refined battle system which allows you to fight as both Blades and their masters, the Drivers. The all-new prequel story will be playable on 14th September for Expansion Pass owners, and the retail version will be made available on 21st September. Will you be playing this new expansion when it arrives in September? Have you pre-purchased the season pass? Are you going with the retail or digital copy? Tell us below. Very interesting. I hope it has enough content to justify a standalone release. Now that I have an actual job, I can afford to double dip for the physical version even though I have the DLC already lel. I think this expansion will be suitably meaty though. At the very least if people are scared off at how big Xenoblade can be, they can start with this first. Preordered the physical release. Not done the main story yet, but I gotta have it! So does it include a download code for the OTHER goodies found in the Season Pass? Because there's no point of buying this physical expansion story if you're getting less content. It does include a download code for the expansion pass (probably the other parts only) while having the expansion story on cart. Nice! Gotta make sure I finish Octopath before this launches! @whiffy5 the game has 7 chapters, even if those are around the length of some of the shorter chapters in Xenoblade 2, you'll be still looking at a ~20h game. And they probably have a fair bit of side quests in Torna as well. That's stupid, trading a box without a cartridge, a value of a physical copy is totally missed. In recent generations games lost beautiful manuals, now quite often they require downloads before you can actually play, & next is lack of a media at all. I'm totally fine with my limited edition copy + season pass, without a plastic case & printed cover for extra 10$. @oji sighs didn't read the article I see. Here's how it works, Torna the Golden Country will be on an actual game card, you will not need any form of Xenoblade Chronicles 2 to play it. The code is for the other DLC content that's used in the main part of XC2(New quests, blades plus the money and items). Wish they had done this with the Breath of the Wild Expansion; although I believe that was less in scope so probably wasn't deemed financially viable. Although I do wonder if Complete versions of both BotW and XC2 may appear later in the Switch's lifetime. So does the physical just have the expansion? Or does it have the msin game + the expansion? Because I haven't bought the main game yet and don't really want to buy two separate copies. 1. PHYSICAL CARTRIDGE containing the Torna expansion as a STAND-ALONE GAME. It's a cartridge, not a download code. 2. PHYSICAL CODE CARD with an eShop code containing ALL EXPANSION PASS CONTENT for Xenoblade Chronicles 2. 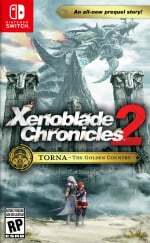 In short, you're getting the Torna expansion as its own game, as well as the downloadable content for Xenoblade Chronicles 2 - which of course needs to be redeemed on the eshop and downloaded because putting it on the cartridge would be dumb, as you can't play Xenoblade Chronicles 2 with the Torna cartridge in unless you got it digitally. So fellow physical collectors, rejoice, you can pre-order it and actually get it as a full game on its own cartridge. Got the Xenoblade 2 Season Pass, so I won’t be getting the standalone. I just felt I’d like the real game enough to get the season pass and just get it all in one swoop. On that note... does anybody know how much space this expansion is gonna take? The fact its big enough to be on its own cartridge worries me a little bit. @Blizzia Yup, this was definitely something for us stubborn physical cart collectors. With that in mind, it's probably going to be a relatively limited run, so I'm grabbing it at launch. @Regpuppy Definitely. I'm not taking any chances. Can sell it later if need be, but grabbing it while there's a 100% chance of getting it. @whiffy5 Torna’s supposedly 40 hours long, so it’s certainly not going to be too short. I love the way they're releasing this. Everybody wins. I'm going to grab a copy ASAP even though I'm not even halfway through the main game. I'm looking forward to starting with the prequel and a physical release is perfect. If it's good the I'll likely get into xenobalde. The game is huge (so I hear) and ain't no body got time fo dat... or do I? Ahhh ok, I was under the impression that Torna would be DLC only so I turned a complete blind eye to this and washed my hands of the XC2 experience. But now I see that I'll have a shot at GameFlying it since it'll have a physical release. Looks like I'll be playing Torna after all. Back to the world of XC2 I go then! I'm one of those people who was very confused by this in the beginning. I've understood it for awhile now but it took a lot of research on my part. I do like that they put it on a cart, but I'm not paying $10 for a box. In the US the DLC season pass is $29.99 but the stand alone box is $39.99. Even with my prime discount it's $32. Since most people who wanted the game and DLC probably already bought it I would have preferred a "complete editon" on 1 cart for $69.99. I'll wait awhile for that just in case. Still playing Ni No Kuni 2 and DQXI releases in September, a $60 game with no season pass that I can buy from Amazon for $47. Now I just need to decide when I get this which to play first, game order or time line order. @Blizzia dude, your post should be a headlining article...very clear & to the point! Thanks! @rjejr I used your same logic to justify buying the expansion pass as a physical edition. Since it is only $2 more to buy the physical edition (with prime discount) vs digital version. But I also have terrible internet where I live, slow and constantly cuts in and out. So any large download is all but impossible for me. I would recommend starting with the original Xenoblade 2 then move on to the prequel story. If you play the prequel first it will ruin several surprises for you. But it's up to you. @Lone_Beagle Haha, you're very welcome. I felt like the article itself (as well as Nintendo's own website) still didn't write it as clear-cut as it should have been. To make sure, I also phoned Nintendo to inquire about it - what I've written is accurate. Crazy question: do you think I can play the prequel without playing the real game first? I would think so. I've had the Expansion Pass since launch and I'd say it's been worth it already with the new blades (including Shulk and Fiora), several side-quests and Challange Mode. Adding a complete stand-alone prequel expansion on top off that is just overkill. Monolith Soft deserves a lot a praise for this. @rjejr It's $10 for a physical storage device and box. $2 for physical storage device with Prime discount. Cheaper than SD card space. Well worth it. Maybe there will be a complete edition at some point, but that depends if it fits on one cart, and N isn't likely to do a digital bundle they can't do as a physical bundle, so it would probably just be XC2 + Season pass code. @Tsurii And if those side quests involve grinding that one blade with that one skill and finding 20 freaking ivy that never ever spawn, you can go for hundreds of hours! @NEStalgia Ok thank you! Will keep that in mind. So I just need a 40% off sale for Black Friday and I'm good. And just b/c Nintendo "tends" not to have done things in the past doesn't mean they wont. Luigi Levels were sold just like XC2 DLC, both physical and digital. And then they started selling both together on 1 disc for the price of the original game. Plus they've also done some other weird stuff like that Zelda Explorers Ed on Switch last Christmas w/ a map, and the Splatoon 2 Starter Edition w/ 2 sticker sheets. Admittedly neither of which contained the DLC but it shows Nintendo is willing to rebox their games so really at this point almost anything is possible. Amazon is currently selling both editions of Spaltoon 2, and each has their own listing, not a drop down box like multiplats and other special editions sometimes have. Weird. But add those up and I'd say Nintedo has gone down the reboxing path enough that a complete XC2 isn't out of the question. Probably 1 cart in a box w/ XC2 on it and a code for the season pas which includes Dorna, to download. Amazon Prime doesn't discount those anymore but I'd pay $60 for a new box, cheaper than $50 (current box price) and $30. Amazon still also has the $100 "special edition" for $90 but it bothers me so much that it doesn't include the season pass so I passed. Oh, just found out Amazon also has the digital bundle. If it goes on sale I'll get it there, 5% back w/ Prime plus I always have Amazon credit of some type. @rjejr That sounds like Ubisoft "bundle" pricing. "Buy all 3 together and pay only the price of all three!" I’ll grab the cart. Seems likely to be gone quickly. I’ve only played about 5 hours of XC2, so I’ll just keep this sealed for now. @NEStalgia "Wow, you love your credit cards..."
So it is like love, you can drown in it. I never used to buy "collectors editions". Started w/ Little Big Planet 2 for the bookends and stuffed Sackboy. Then I got XCX for the book since it was only $20 more than the game itself. Might have been an Amazon Prime discount on that one. I don't really like music all that much so soundtracks and/or CD sets dont' appeal to me. I have started buying hardcover guides for the pictures and maps, FFXV and Zelda BotW, b/c I have a map addiction. That book does sound nice, but not $30 nice. @JasmineDragon Wait until you finish Chapter 6. You should see the lore about Torna before you play this. @rjejr That first paragraph so beautifully encapsulates absolutely everything that has gone wrong with American society. That entire conversation should never actually have been possible. Like your map addiction, I have steel book addiction I've long bought special editions for the steel book. Oh and the plush cat-thing with Persona 5 But I started backing off from them after Skyrim and the dragon statue I thought would fit on a desk corner and in reality needs its own small room I got my money's worth but....what am I ever going to do with that?! I learned again with Sonic Mana and the "basically actual size" Genesis model which I pictured to be a desktop ornament. @NEStalgia "That entire conversation should never actually have been possible." But it is possible to make it like it never actually happened, which was the plan all along. @amiiboacid No worries, I plan to at least try to finish the main game before starting Torna. Is the code which comes in addition to the cartridge in the physical release the full fledged expansion pass, or just the dlc content excluding the torna dlc? What Im asking is, if another person would use the code, would that person get the full expansio pass content including the torna dlc? @whiffy5 I'm pretty sure the standards are high here - There is so much quality content in XBC2 . I'm excited!